LeChuck is a classic villain. He has a singular and grandiose focus, always has a sinister plan to achieve his ends and repeatedly opens himself up to being defeated by a bumbling loser with luck on their side. It doesn't get anymore basic than that. And yet, he has a style and flair all his own. It's probably all of the voodoo. 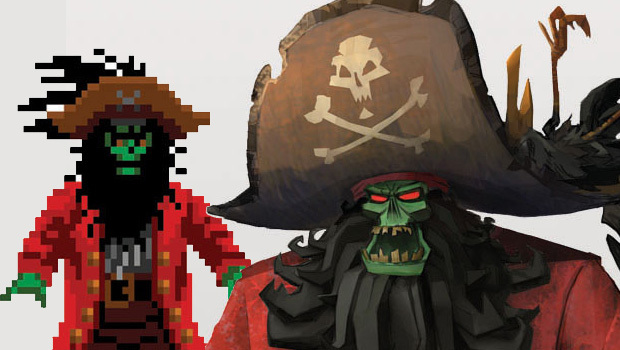 LucasArts Games released a group of images showing the development of LeChuck's look in the upcoming Monkey Island 2: LeChuck's Revenge Special Edition. I really like the page with all of the faces. It's a hard line to walk between cartoonish and sinister with this particular character and I'm pleased with what they've come up with. What do you guys think?